Strawberry Girls, an instrumental math rock trio featuring Zac Garren on guitar, headline Aorta Music and Management's Easter Sunday show at The Ballet Haus. Erie's newest all-ages music venue, The Ballet Haus, is quickly gaining traction in Erie's growing music scene. In its short lifespan thus far, the venue has been able to attract a considerable amount of showgoers through their doors, a feat which Elvis Maryshine of Aorta Music and Management attributes to her agency's work ethic, among other things. "Our approach to promoting is very much a lot of face-to-face interaction with our patrons," Maryshine says. "My staff and I go around the city, hand out flyers everywhere we go, and we encourage local bands to do the same." Maryshine also credits the venue's success to working towards building a sense of community around the music scene. "You want to make the environment welcoming and amicable. We have developed regulars that come to every single show no matter if they've heard of the bands or not … we genuinely care about making the community and scene better and we show it." One of the next shows at The Ballet Haus is headlined by California-based three-piece instrumental math rock band Strawberry Girls, when they roll into Erie on Easter Sunday. 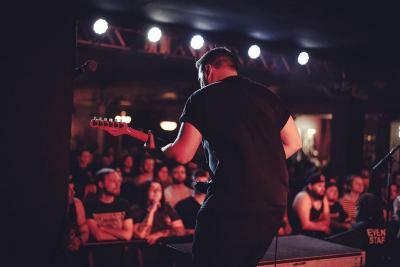 Strawberry Girls was formed in 2011 by guitarist Zac Garren, shortly before leaving his former band, Dance Gavin Dance. The band has released three self-recorded albums through Tragic Hero Records, and are currently working on material for a fourth album to be released this year. Second on the bill is Elbow Room, making the short drive over from Cleveland. Elbow Room's blend of emo, pop-punk, and alternative rock have landed them a spot at Penultimate Records, who released their debut album, Constant Mistake, last October.